Usually my trips down to Torrance only involves Japanese restaurants and bakeries, but I broke the pattern on my latest trip with brunch at the Lazy Dog Cafe. 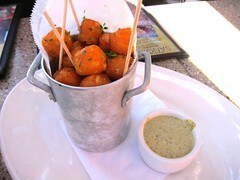 Fellow blogger LA OC Foodie ordered this, but luckily he was generous enough to share. 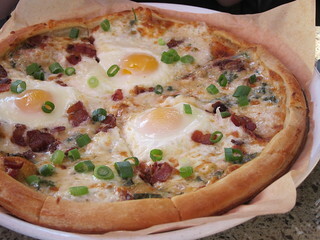 It was my favorite thing I had at Lazy Dog, especially the slices with the egg yolk on them. It's breakfast on a pie! Hmm, maybe they should put six eggs instead? The bacon lovers should try the Bacon Bloody Mary (Vodka, housemade crispy bacon infused bloody mary mix, pepperoncini, pickled cherry pepper,olive, bacon-corn nut salt, $7.50). I'm not a huge fan of savory cocktails and bloody marys so I didn't order one. I tried a sip of someone else's and it's got quite a kick to it! 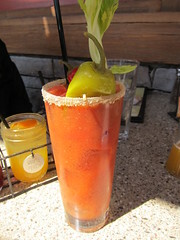 Bloody Mary lovers should enjoy this one. 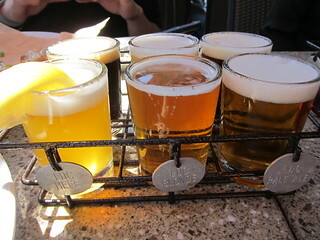 Lazy Dog Cafe has their own house brews, made by the brewery Firestone Walker and you can get a taster of six for $6.95. The taster includes the Lazy Dog Honey Blonde, Lazy Dog American Hefe, Lazy Dog Bavarian Hefe, Lazy Dog Pale Ale, Lazy Dog Red and a seasonal beer (which happened to be the Firestone Velvet Merlin the day we went). 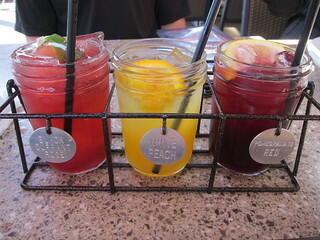 Out of the Lazy Dog beers, we liked the red ale the best, and I also liked the Bavarian Hefeweizen. The three have pretty distinct flavors. I liked the white peach and black-currant rose, but if you've never had them, the sampler trio is definitely the way to go. 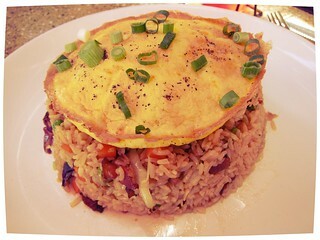 I wished they had put a sunny side up egg with runny yolk with this instead of the frittata-like egg. It's an enormous amount of food for the price-I could barely eat a third of it - but I much preferred the breakfast pizza. We had to try the pancakes for dessert, especially one with a bacon butter, no? The maple bacon butter actually had chunks of bacon in them! This made me be picky when I spread the butter, as I had to look for the parts with the chunks. 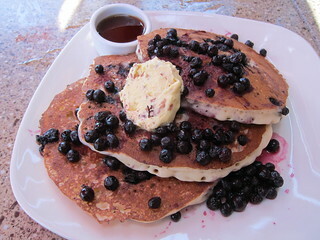 The small, wild blueberries are sweeter than the big supermarket kind and thus worked better as a pancake topping. When you live far from Torrance, it's hard to go there without stopping at at least one Japanese restaurant or bakery, but Lazy Dog Cafe should certainly be a spot for the locals. The menu is a good value, they have their own brews plus a few more local craft beers on tap, and that addictive sunny side up pizza!